The case, Nabam Rebia vs the Registrar, Gauhati High Court, being heard by the five-Judge Constitution bench comprising Justices JS Khehar, Dipak Misra, Madan B Lokur, Pinaki Chandra Ghose, and NV Ramana since 15 January is of interest to students of Parliamentary politics. The question that is likely to be answered at the end of this hearing is whether the Governor has the discretion to call a meeting of the legislative assembly without the aid and advice of the Council of Ministers. The other related question regarding the scope and ambit of the Anti-Defection Act will also come under scrutiny. The present crisis began with 21 of the 41 Congress MLAs in the 60-member assembly rebelled. Eleven BJP MLAs and two independent MLAs backed the rebels. Before dwelling into the Constitutional issues, the timeline of the present crisis will be instructive. Nabam Rebia, the ousted Speaker of the Arunachal Pradesh assembly first challenged in the Guwahati High Court, the state Governor, JP Rajkhowa’s order dated 9 December 2015 advancing the state assembly session from 14 January 2016 to 16 December 2015. In a message dated 9 December 2015, the Governor fixed the resolution removing the Speaker from the office as the first item of business in the advanced assembly session, which was held outside the assembly hall on 16 December. On 15 December, Rebia disqualified 14 MLAs of the ruling Congress. On 16 December,the Deputy Speaker, Tenzing Norbu Thongdok, ordered the removal of the Speaker, in pursuant to the resolution adopted by the assembly, held outside the assembly hall. Rebia also challenged in the Guwahati High Court the Deputy Speaker’s order dated 15 December 2015 quashing the disqualification of 14 MLAs by the Speaker, under the anti-defection law. The sitting of the Sixth Session of the State assembly was notified for 14 January 2016 by the Governor on 3 November, 2015, and at that stage, the 16 Congress MLAs gave notice for removal of the Deputy Speaker. After this, the 11 BJP legislators issued notice for removal of the Speaker, which was supported by the two independent MLAs as well. The 13 MLAs in the Opposition requested the Governor for advancing the assembly session for considering the Speaker’s removal. The Governor acted upon the request of the opposition MLAs, and ignored the request of the 16 Congress MLAs for removal of the Deputy Speaker. The Congress party whip applied for disqualification of 16 MLAs under the anti-disqualification Rules. The State Cabinet passed a resolution on 14 December 2015 to the effect that the Governor’s decision to advance the assembly session was contrary to constitutional provisions and the Rules of Procedure. The matter was first heard by Justice Hrishikesh Roy, who in his judgment on 17 December 2015, had made certain prima facie observations. 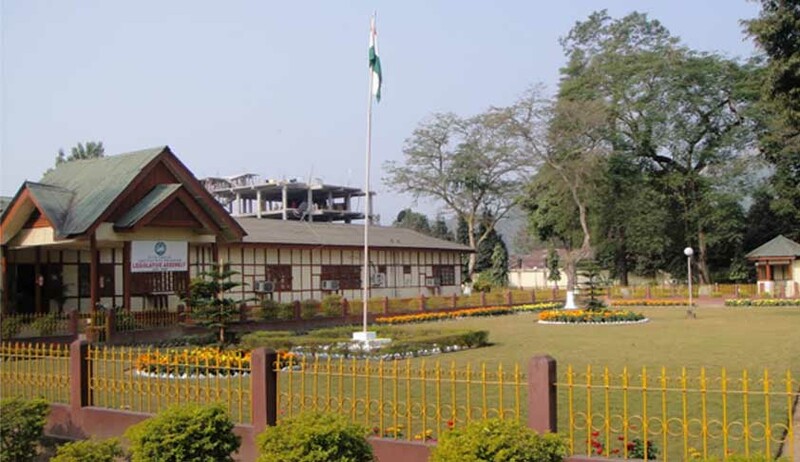 The Governor, Justice Roy said, while summoning the House of the State Legislature, is required to perform his duty with the aid and advice of the Council of Ministers and the Chief Minister, in consultation with the Speaker, is made competent to advice the Governor, for summoning the assembly, under the Rules of Procedure and Conduct of Business of the Arunachal Pradesh Legislative Assembly. Justice Roy observed that the Governor acts as a Constitutional head and, therefore, his decision to advance the assembly session without the advice of the Chief Minister and primarily on requisition made by the Opposition MLAs, taints the Governor’s order and renders it unworthy of the State’s constitutional head. Specifically, Justice Roy said that the power of the Governor to send message to the House is with respect to a pending bill in the House and this power under Article 175(2) can’t be utilised to send message on a pending resolution for removal of the Speaker and hence this appears to be an act of exceeding the jurisdiction. Justice Roy also pointed out that the resolution for removal of the Deputy Speaker was moved prior to the similar resolution for the Speaker and yet the Governor has fixed the later resolution as the first agenda. This suggests a non bonafide intervention by the constitutional head in the context of his decision to advance by a month the assembly session only in order to take up as a first agenda, the resolution for removal of the Speaker in a session to be presided by the Deputy Speaker, who himself is facing a resolution for removal, from an earlier date. Justice Roy said when the Governor acts on his own discretion, his action must be for furtherance of the Constitutional goals, and that the de facto authority of the State vests on the elected Government and not on the Constitutional head. Justice Roy felt that the Governor’s non-neutral role was undermining the democratic process. Justice Roy had stayed the orders including the removal of the Speaker which were challenged by Rebia. Surprisingly at this point, the Acting Chief Justice of the High Court, Justice Tinlianthang Vaiphei, in his administrative capacity, permitted the change of bench, as requested by the Opposition parties, and the Registrar listed the matter before Justice Biplab Kumar Sharma who took up the plea for vacation of Justice Roy’s order. When Rebia sought the recusal of Justice Sharma, it was rejected by the Acting Chief Justice in his chambers without hearing him. Thereupon, Rebia challenged this rejection in the Supreme Court. On 14 January, Justice Sharma rejected the writ petition challenging the removal of the Speaker, and refused to go into the merits of a petition challenging the Governor’s decision advancing the date of the assembly session, saying it cannot be said to be “unconstitutional so as to warrant interference by the existing power of judicial review under Article 226 of the Constitution”. A report in Asian Age filed by Manoj Anand from Guwahati on 14 January quoted Justice Sharma as observing that the removal of the Speaker was pursuant to the motion for removal which was passed by 33 MLAs out of 60 voting in its favour, and the resolution was notified on 16 December. According to Justice Sharma’s reasoning, as reported by the Asian Age, once the impugned decision of the governor exercised under Articles 174(A) and 175(2) of the Constitution is upheld, the transaction of business in the advanced assembly session, including the removal of the Speaker will also have to be upheld. Rebia has also challenged this 14 January judgment of Justice Sharma before the Supreme Court. Meanwhile, the website of Arunachal Pradesh Legislative Assembly continues to show Rebia as the Speaker and Thongdok as the Deputy Speaker. The website also does not carry the controversial resolution removing the Speaker and the decisions of the Speaker disqualifying the 14 MLAs or that of the Deputy Speaker annulling the disqualification of those MLAs.